This ad for E. E. Titus Founder and Machinist appeared in Hill's Petersburg City Directory in 1897. The address Jones, Commerce and South Streets became 215 North South Street at a later date. The business was listed in city directories from 1888 through 1960. This later ad for E. E. Titus, Founder and Machinist appeared in a journal called Packages, January 1909. E. E.Titus was Elmer Ellsworth Titus (1864-1935). He was born 17 February 1864 in Fremont, N. Y., and he died, aged 71 years, 4 months and 14 days, 1 July 1935. He is buried in Blandford Cemetery, Petersburg. He appears in the 1880 U. S. Census, age 16, already a machinist, living in Indianapolis, Indiana. His father, James Titus, was also a machinist. 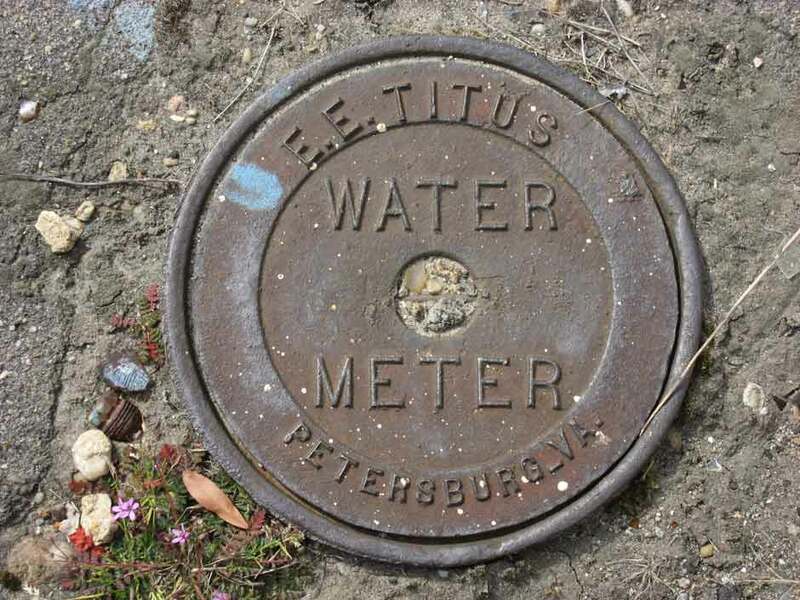 In the 1900 census Elmer E. Titus lived at 237 High St., Petersburg. His family consisted of his wife, Eula L., four children, ages 15 to 9, and his father and mother. One of the children, Grace, age 9, is recorded as born New Jersey. When James M. Titus, Elmer E. Titus' father, died in 1901, the following appeared in the Baltimore Sun 31 January 1901, pg. 5, "Petersburg, Va., Jan 30 - Mr. James M. Titus, a widely known citizen of this place, died very suddenly this morning of throat trouble. It was only yesterday that he went over to Richmond to consult a specialist in regard to his case. The deceased was a native of Connecticut, but came to Petersburg some years ago from Indianapolis, Ind. At the time of his death he was engaged with his two sons in the manufacture of machinery." Both sons of E. E. Titus, James Madison Titus (1884-1952) and Elmer Ellsworth Titus Jr. (1889-1918) followed their father into the business. In 1941 James M. Titus was listed as president-treasurer at E. E. Titus, Inc., and his son, Elmer Neil Titus (1906-1974) was secretary. With E. Neil Titus, two other sons of James M. Titus comprised the third generation in the business. These were James Madison Titus Jr. (1911-1994) and Jennings Harwood Titus (1920-2008). Jennings Titus' obituary, Progress Index (Petersburg, Va.), in 2008 included, "Jennings Harwood Titus, 87, of Petersburg, died Saturday, March 1, 2008. Born in Stratford, N.J., he was the son of the late James Madison and Lillian Marley Titus.� He was a graduate of Randolph Macon Academy and served in the U. S. Army Air Corps during World War II and was a prisoner of war. He was co-owner and was secretary/treasurer of the E.E. Titus Machine Shop and Foundry Inc. and was a retired employee of Quality Lincoln Mercury." This ad from 1965 from the Petersburg, Va., Progress-Index included "Established 1884," a portrait of the founder, and listed E. Neil Titus, J. Madison Titus and Jennings H. Titus as company officers. E. E. Titus seems to have closed down in 1974 following the death of E. Neil Titus.